This is the place to get serious—a stimulating, private arena for movers and shakers. Sequestered above the Courtyard, the Green Room is set for a meeting of the minds. We expect to be replenishing many coffee cups as legendary deals are inked in this room. Offering a wide range of business services to help ensure your function runs seamlessly, seating can be arranged to accommodate theatre-style lectures, a formal boardroom setting, or smaller workshop groups. In the evening, redefine the atmosphere and like magic the Green Room becomes the ultimate venue for your exclusive, private cocktail or dinner party. Intimate and elegant, your soirée is sure to be the talk of the town. 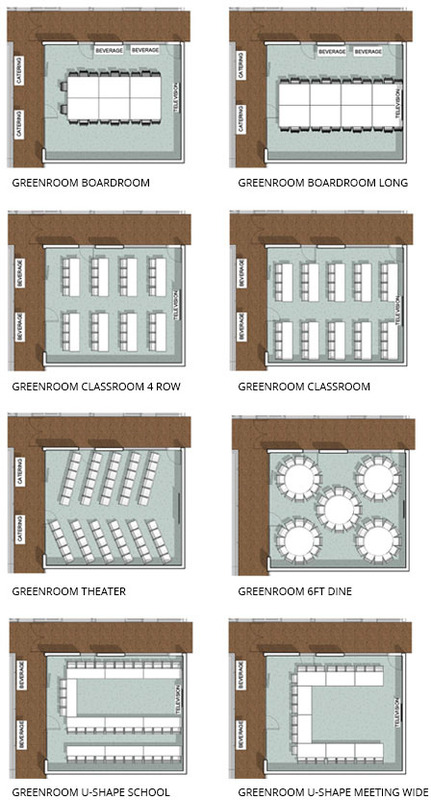 The Green room can accommodate up to 44 people for a variety of settings from a boardroom style meeting or theater style conferences to receptions and seated dinners. If you are using a screen reader, and are having problems using this website, please call (310) 546-4995 for assistance. © 2019 Shade Hotel. All rights reserved.